In honor of the late Dave Overpeck, an outstanding motor sports reporter for the Indianapolis Star and former AARWBA President, AARWBA provided a scholarship at Indiana State University to an incoming freshman journalism student. The $1,000 award was designed to further the student's journalism education. It was presented annually at the AARWBA breakfast at the Indianapolis Motor Speedway on the morning before the Indianapolis 500 Mile Race. Ron Lemasters, AARWBA Midwest Vice President, Karen Overpeck (Dave's widow) Kaci Lientz, and her parents Melinda and Raman Lientz. INDIANAPOLIS, IN - (May 21, 2010) - Kaci Lientz, a junior at Indiana State University, has been named recipient of the 2010 David Overpeck Memorial Scholarship, presented annually by the American Auto Racing Writers and Broadcasters Association. She is a communications major with a public relations emphasis and a motorsports management minor. "Obviously, I want to work in racing and I'd really like to be involved in public relations for a NASCAR driver or team," she said. "Racing has been a family interest for as long as I can remember. My Dad is an Indianapolis 500 fan and Mom is a NASCAR fan, so we have all been to the 500 and the Brickyard 400 and to many other race tracks." Kaci, the daughter of Melinda and Raman Lientz, is a graduate of Rockville High School. Kaci attended the University of Indianapolis for one semester, but transferred to Indiana State after learning that ISU had a drag racing team that offered hands-on experience in her area of career interest. Kaci is currently in an internship with the United States Auto Club (USAC) and has been accepted an internship in 2011 with NASCAR Kinetics. The NASCAR program, begun in 2009, is a "marketing in motion" experience that is offered on five college campuses nationwide. Kaci, accompanied by her parents, received the $1,000 scholarship Saturday at the annual AARWBA Indy 500 breakfast. The Overpeck Scholarship is presented by AARWBA in memory of longtime Indianapolis Star motorsports writer David Overpeck, who was an organizer and past-president of AARWBA. An enthusiastic supporter of media rights in the motorsports arena, Overpeck succumbed to cancer in 1988 at age 46. Michael Kinsey, Blaine, Mom Tammy Kinsey, Karen Overpeck and Ron Lemasters. 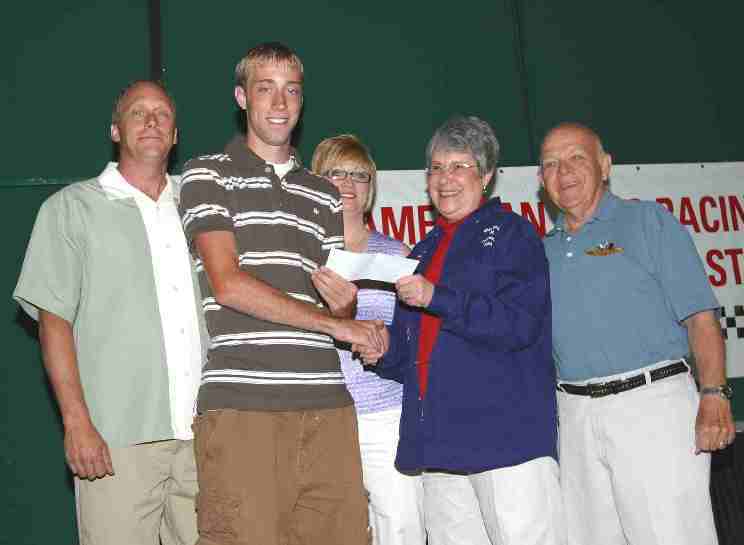 INDIANAPOLIS, IN - (May 23, 2009) - Blaine Kinsey, a sophomore at Indiana State University, is the 2009 recipient of the Dave Overpeck Scholarship. The Scholarship, given by the American Auto Racing Writers and Broadcasters Association, honors the late Dave Overpeck. A graduate of Indiana State, Overpeck was a sportswriter for the Indianapolis Star and a past president of the group. Overpeck worked hard to better the working conditions for the media at major motorsports venues. Kinsey is a communications major at ISU with journalism/electronic media focus. An avid motorsportts fan, Kinsey has attendedraces at many major facilities. With Kinsey were his parents Michael and Tammy Kinsey of Huntington, Indiana. The $1,000 scholarship was presented to Kinsey at the annual AARWBA awards breakfast Saturday, May 32 at the Indianapolis Motor Speedway by Overpeck's widow, Karen and AARWBA Midwest Vice President Ron Lemasters. INDIANAPOLIS, IN - (May 26, 2007) - The 2007 winner of the Dave Overpeck Scholarship is Ben Corn, a student at Indiana State University. INDIANAPOLIS, IN - (May 28, 2005) - The 2005 winner was Henry Boguslavsky, a junior at Indiana State University. He is an indianapolis resident and a graduate of North Central High School. A marketing and journalism major at Indiana State, Boguslavsky carries a 3.0 grade point average. 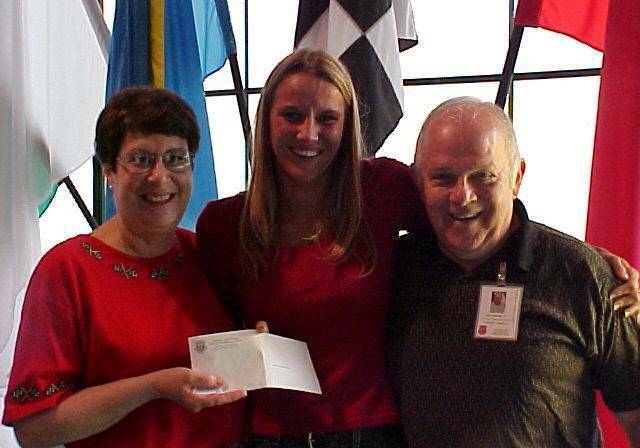 He is currently performing an internship at Fox Sports in Pittsburgh, PA.
Denise Pennington (c) receives her scholarship from Karen Overpeck and Ron LeMasters Jr.
INDIANAPOLIS ­­There is little doubt that the late David Overpeck would have agreed with the selection of Denise Pennington as the 2002 recipient of the David Overpeck Memorial Scholarship. The $1,000 scholarship is given annually by the American Auto Racing Writers and Broadcasters Association in the memory of former Indianapolis Star sportswriter David Overpeck, an organizer and past president of AARWBA who succumbed to cancer in 1988 . A senior at Indiana University-Purdue University Indianapolis, Denise is already immersed in the Indianapolis 500. Working with Jan Shaffer of the Indianapolis Motor Speedway media center staff, she is in charge of the audio program. Her duties include interviewing drivers, putting the sound bites into MP3 files and sending them to radio stations and web sites. The program will go on the road this season, with the race at Sears Point Raceway confirmed, and events at Michigan Speedway a possibility. Denise grew up on the west side of Indianapolis, attending Ben Davis High School until her senior year before moving to Missouri. She graduated from Puxico High School, but returned to Indiana to attend Overpecks alma mater, Indiana State University, before transferring to IUPUI. Denise expect to graduate after the fall semester this year. As for the future Id like to continue the program Jan and I have started. she said. Id also like to eventually go to law school once I receive my finance degree. Denise received her scholarship at the annual AARWBA breakfast May 25 at the Indianapolis Motor Speedway. The 2001 winner was Craig Pearson. Pearson, from Francesville, Indiana, attended West Central High School. He currently attends Indiana State University where he is a journalism and a sports management major. He has written for both the Indiana Statesman and IQ Magazine at ISU Student Publications. "I want to thank you and the AARWBA for the generous David Overpeck Memorial scholarship," said Pearson on learning of the award. "I have worked at the Terre Haute Tribune-Star as a sports reporter since January. "I hope to pursue a career in sports journalism at a newspaper or magazine. Also, I will intern at the National Federation of State High School Associations next spring in their publications department. Working for a sports organization publication also interests me as well as jobs in sports management." 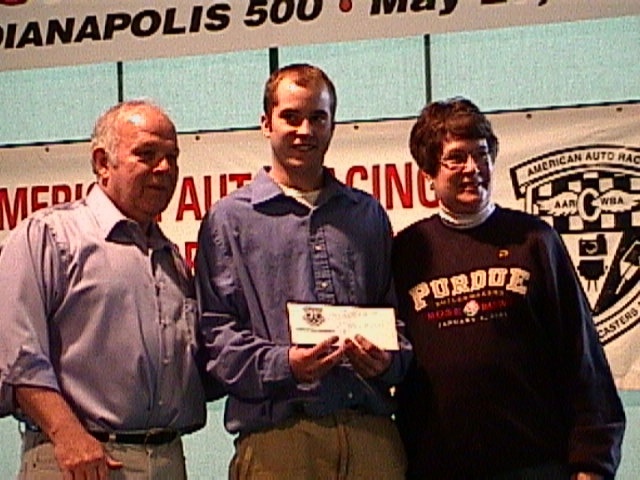 Pearson received his award at the annual AARWBA Breakfast at the Indianapolis Motor Speedway on Saturday, May 26, 2001. The 2000 winner was Jesse Cox. Cox, a senior at Indiana State University, has been named recipient of the David Overpeck Memorial Scholarship given by the American Auto Racing Writers and Broadcasters Association. Overpeck, an organizer and past president of AARWBA, was a graduate of Indiana State University. The scholarship given in his memory goes to an ISU student majoring in journalism or a related field who has an interest in the field of sportswriting. Cox, 21, from knox, md., is sports editor of the Daily Statesman, the ISU campus newspaper and hopes to enter the journalism field upon graduation in either the daily newspaper or magazine field. He is serving a summer internship at the Banner-Graphic in Greencastle. Overpeck, who died of cancer at age 46 in 1988, joined the sports staff of The Indianapolis Star upon his graduation in 1964. After 20 years at The Star, Overpeck joined the Fleischman-Hilliard public relations staff for a year. He was employed by the Machinists Union racing team at the time of his death. During his tenure as president of AARWBA, Overpeck worked with Indianapolis Motor Speedway officials in establishing formal driver press conferences, and it was through his efforts that television monitors were made available in the IMS media center. Cox received the $1,000 scholarship at the annual AARWBA breakfast.